The Dennis brothers have stepped into new territory in their bid to complete the double in the Gr.1 three-year-old classics at Riccarton on Saturday. Tony, Joe, Ray and Martin Dennis, recipients of the 2016 Outstanding Contribution to New Zealand Racing Award, won the 2002 Gr.1 New Zealand 1000 Guineas (1600m) as owners and breeders with The Jewel and this weekend they will be looking to add the Gr.1 Al Basti Equiworld Dubai New Zealand 2000 Guineas (1600m) to their trophy cabinet with the unbeaten The Chosen One , a grandson of The Jewel. This time, however, there is a bigger group racing The Chosen One, a son of Savabeel and the successful Flying Spur mare The Glitzy One, who won eight races from 1400m to 2500m. “It’s the first time we’ve put a syndicate of our own together,” Tony Dennis said. ”We usually just race them ourselves. “We tried to sell him at Karaka as a yearling and we put a $150,000 reserve on him, but he got to $130,000. “Later Tony Rider suggested we syndicate him. He took 10 percent straight away and it went from there. Under the guidance of Baker, The Phantom’s performances included a win in the Gr.1 Underwood Stakes and a second in the 1990 Gr.1 Melbourne Cup (3200m). “The syndicate just went from there,” Dennis said. “Our family has ended up with 40 percent and the rest is divided up with friends. The syndicate includes Janine Dunlop, who regularly prepares the Dennis brothers horses for the National Yearling Sales at Karaka under her Phoenix Park banner and put The Chosen One through her draft. “It has all happened quickly with him,” Dennis said. The Chosen One was placed in one of his four trials before he scored an eye-catching debut win over 1400m at Waverley early last month and was then put to the 2000 Guineas’ test in the Listed Zacinto Stakes (1600m) at Riccarton 23 days later and passed with flying colours, winning by two and a quarter-lengths. 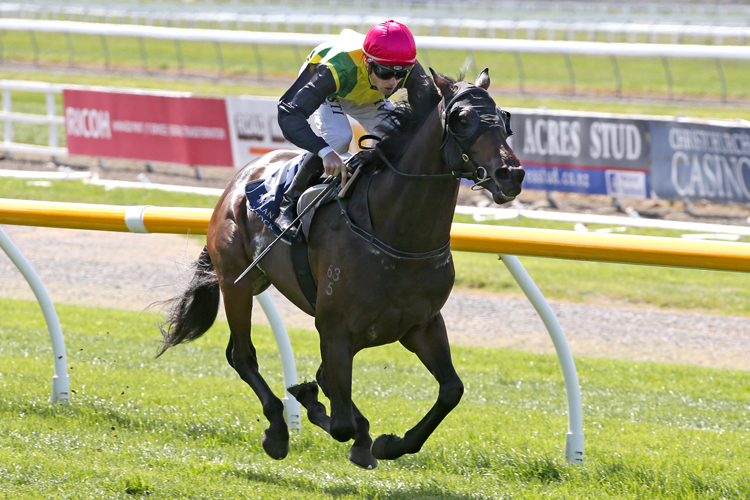 On the strength of that Riccarton performance he has emerged as a strong chance to give the Baker – Andrew Forsman stable its third win in the 2000 Guineas, following on from Turn Me Loose in 2014 and Atlante a year later. The Chosen One came under offer after the Zacinto Stakes, but the syndicate has elected not to sell the smart youngster for now. “But the offers could become too much if he happens to win the 2000 Guineas,” Dennis said. A few days after The Chosen One tackles the 2000 Guineas, The Precious One (a daughter of The Jewel) will be attempting to add to her record of four wins and a third from six starts when contesting the Gr.3 Valachi Downs Canterbury Breeders Stakes (1400m) on the second day at Riccarton, next Wednesday. The Chosen One, a $5 second favourite behind stablemate Madison County ($2.80), has drawn well in barrier four and will be ridden by Jonathan Riddell.